Updated commenting in Acrobat DC | Colecandoo! UPDATE 2016-07-13 Adobe has since put the replace text icon back (see this post) but I will leave this post here for posterity. On 10 May 2016, Adobe released compulsory updates for Acrobat DC and Acrobat Reader DC. Unlike many updates where there is a prompt to install the upgrade or not, this release did not present the user with a prompt and installed the update. I was aware an update had taken place because there was a new prompt window that would not disappear until I had selected the checkboxes that acknowledged that I had learned the new features. That said, I should have paid a bit more attention to the update, especially this one! It was not until late May that a colleague who was proofreading some artwork had noticed that a fundamental commenting tool was missing: Replace text. Concerned, I opened PDF that I sent my colleague and attempted to edit it, indeed learning that the replace text commenting tool was missing, along with the highlight and comment tool. A quick search on the forums revealed that we weren’t the only ones to notice. Strange too because not all of the Adobe help issues have been changed to reflect the recent update. This page still has old instructions. In short, to improve the experience with the commenting tool, users are encouraged to use the black arrow tool to highlight affected text and either hit the delete key to denote a deletion, begin typing to denote a replacement, or place their cursor and begin typing to denote an addition. To be fair, once a user is familiar with this behaviour, it is easy to begin making alterations to a proof. However, I was less than impressed with Adobe’s execution of this strategy by removing tools to force us to use the new tools, especially considering that the change wasn’t explained in their own updates. I decided to vent my spleen via twitter to Adobe’s customer care and the Acrobat team. As you can see from the tweets, it largely fell on deaf ears. The reason for my frustration is not my one-off frustration in learning the new commands, but the fact that I now have to explain this behaviour to hundreds of customers who infrequently use Adobe Acrobat. It has taken years to train the customers to use the commenting tools so that markups can be made that can then be edited in Adobe InDesign using the DTP tools annotations plug-in. That’s assuming that the Adobe Acrobat team doesn’t change the interface again and decide to remove more tools. This is not my only gripe with Adobe Acrobat at the moment. My colleagues and I are experiencing strange and unusual errors with Acrobat at the moment. In fairness to Adobe, this may have something to do with the Enfocus Pitstop plug-in that is installed. Regardless, it is making what was once an efficient workflow much more complicated. 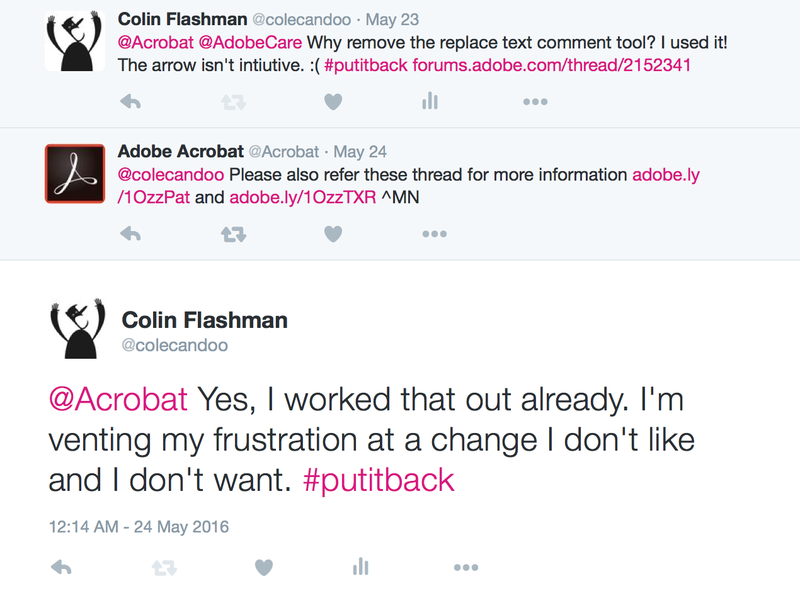 Pingback: Bring Back the Checkbox in Acrobat Comments | Colecandoo!